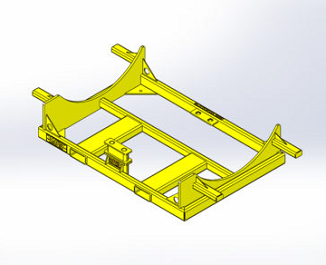 Provides a stable base and holds the traction motor level. Keeps the wheel set from resting on the ground preventing possible damage to the ground surface. Can hold the weight of two traction motors stacked on top of each other. Holds traction motor combos with wheels up to 44″ in diameter. Design changes have recently been made to the base to allow G.E. AC motors to be stacked. A removable Spacer Block accommodates the G.E. AC and all other traction motor types. 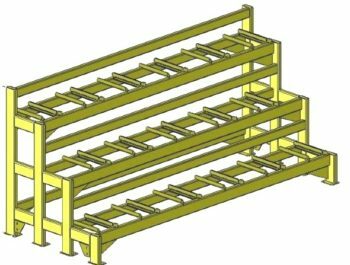 This stacking fixture is not to be lifted with a traction motor assembly on top of it. 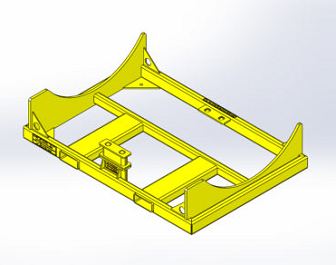 This version of the Stacking Fixture is equipped with lifting points on either side for handling with Specialized Forklift Traction Motor Handling Fixtures. They are not designed for handling with conventional forklift tines. 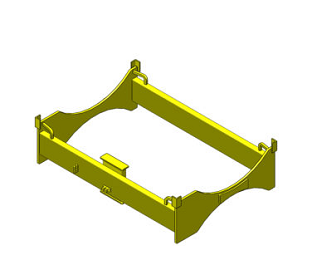 This stacking fixture is not to be lifted with a traction motor assembly on top of it. Floor space is something every locomotive shop is in need of. 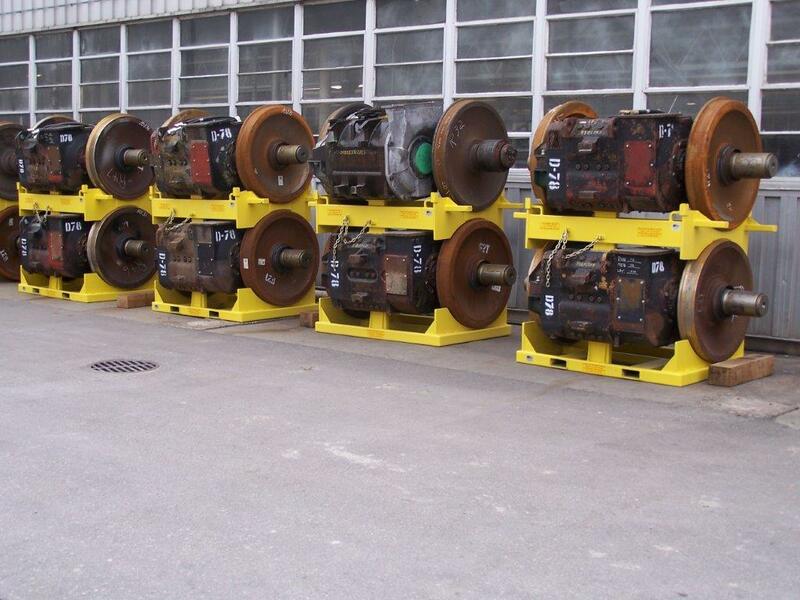 The Traction Motor Stacking Fixtures safely allow motors to be stacked two high, reducing storage space by one hundred percent. Holds traction motor combos with wheels up to 44″ in diameter. It will be necessary to place either a steel or wood block under the traction motor closest to the floor to provide a reasonably level platform to stack the upper motor. Steel stacking bases are available. 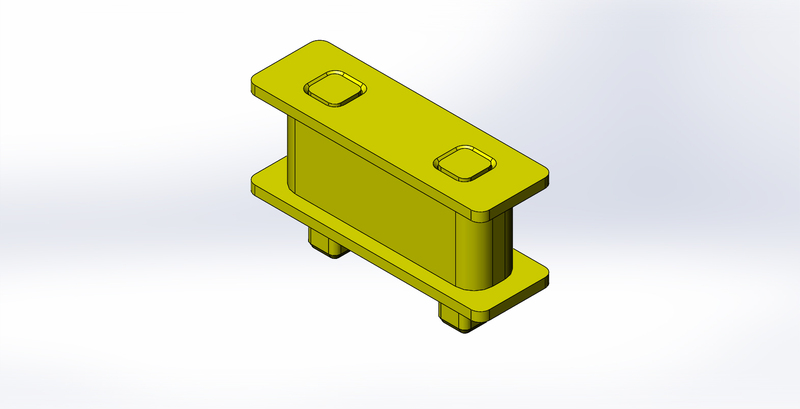 This rack is designed specifically for the 304 style rotary coupler. It will not work to store 208 or other style rotary couplers.